Three factions, a host of heroes and huge battles. Dawn of War 3 campaign lead Brent Disbrow says the team wants to “quite honestly raise our game” with the singleplayer campaign for Dawn of War 2. That's quite a claim from the studio that crafted Homeworld's story, and built some top class singleplayer missions such as Carentan Counterattack in Company of Heroes. The studio has experimented with different singleplayer formats over the years, from the territorial system map of Soulstorm to more conventional linear campaigns. Dawn of War 3 will be different again, jumping from faction to faction with each mission as Space Marine, Eldar and Ork forces move to seize a powerful, nameless weapon. The campaign structure allows each faction to grow in power as the conflict escalates. As the story moves on, new objectives and rules are introduced and new elite units unlock, adding tactical depth. These heroes are vital, bringing Dawn of War 2's character development and micro abilities to Dawn of War 3's busier battlefields. 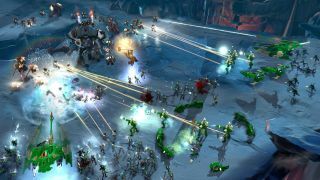 “We wanted to take the epic scale of Dawn of War 1, the large over-the-top battles, and inject into that the awesome heroes from Dawn of War 2, make them the centrepoint of that battle, but have the battle be as large as Dawn of War 1, and bigger still” says Boulle. Each army has three elite slots that you fill before each battle. One of those slots will almost always be occupied by the army's leading hero character—Blood Raven captain Gabriel Angelos, in the case of the Space Marines. The other two slots can house super units such as the Imperial Knight, elite squads, or other individual heroes. Relic suggests that there will be a wide variety of elites to choose from, for all three factions. Since Dawn of War 2, hero customisation and progression has been a key part of the series. We'll have to wait and see how Dawn of War 3's wide range of heroes plays, not just in the campaign, but in multiplayer too. That's where players' favourite hero combinations will be put to the ultimate test.